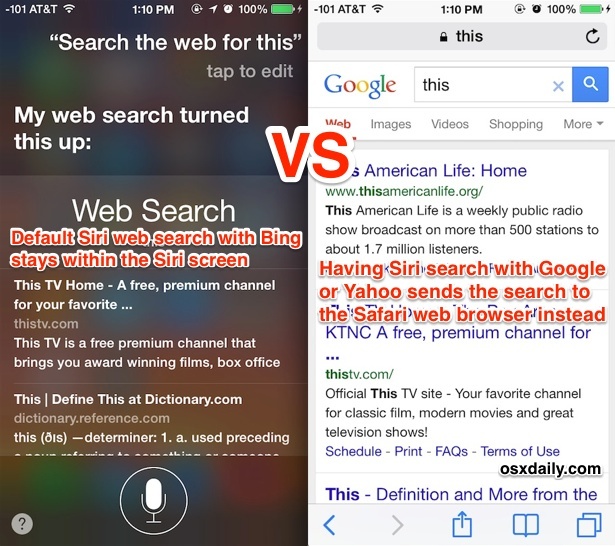 Did you know that Siri defaults to searching the web with Bing, rather than Google? Yes, the results that Siri returns when the assistant says “Here’s what I found on the web” are brought to you by Bing, but they used to be brought to you by Google. That change arrived quietly in iOS 7, obscured by some much more obvious changes, and though some users won’t notice the difference, others may prefer to use a different web search. Unlike Safari search controls that offer a few choices, you won’t find a default search engine toggle within Siri’s general Settings, and instead if you want to use Google or Yahoo you will have to specifically ask Siri to search using those alternatives. Of course, if you don’t care or are otherwise search agnostic, you can continue to rely on the default choice of Bing, there’s certainly nothing wrong with that. This will launch the Safari browser with the phrase you’re looking for into Google. This will also launch Safari with the phrase you’re looking for, this time into Yahoo. 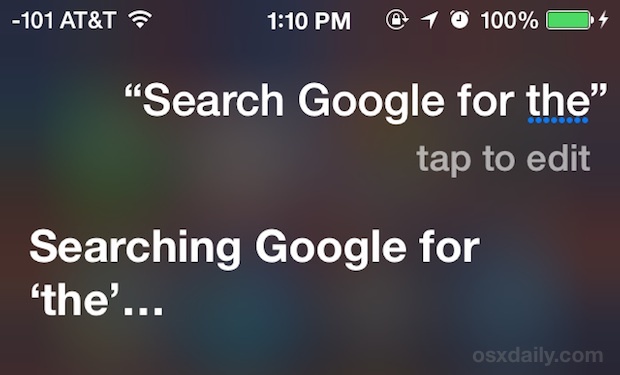 This uses the default Siri web search, staying within Siri until a result has been tapped on. You may notice that searching with the default choice of Bing keeps the results within the Siri screen, while searching with the alternatives of Yahoo and Google moves from Siri directly to the Safari browser. As of now, there’s no way to change that either, but since you’ll wind up within the Safari web browser if you’re searching the web anyway, that’s probably not much of an issue. Also worth noting is that the default search option that stays within the Siri screen also offers optional Image Search results and an option to search Twitter too. Neither of these options will be available from the alternatives within Safari without additional action. Saying “Search” is not required. Also worth noting is that Google or Yahoo searches cannot be performed directly from the lockscreen if you have a passcode. Siri will ask you to first unlock your device before it opens Safari.